The Pulitzer Prize-winning critic was honored on Feb 11 by the College of Media. 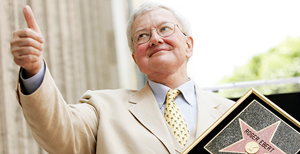 Roger Ebert, who was a Pulitzer Prize-winning film critic and journalist for the Chicago Sun-Times, as well as an influential and groundbreaking film critic on television, will be honored posthumously with the 2014 Illinois Prize for Lifetime Achievement in Journalism. The prize, awarded by the University of Illinois journalism faculty, will be accepted by Ebert’s wife, Chaz, on Feb. 11 at the University Club in Chicago, following a reception and dinner. Ebert, a 1964 Illinois journalism graduate who died April 4 last year, is the sixth journalist and first alumnus to receive the Illinois Prize. Ben Bradlee, Seymour Hersh, Gay Talese, Nina Totenberg and Mike Wallace won previously. The award honors work that has consistently served as a beacon for other journalists, set the highest standards of excellence in the field, and placed the public good and public awareness before all else. Raised in Urbana, Ill., Ebert became the film critic of the Chicago Sun-Times in 1967 and remained there for 46 years, until his death. In 1975 he became the first film critic to be awarded a Pulitzer Prize. That same year, Ebert and Gene Siskel invented a new genre of television with their movie review show “Coming Soon to a Theater Near You” for Chicago’s public station WTTW. It would eventually become the nationally syndicated “Siskel and Ebert at the Movies” and Ebert would review movies on television for more than three decades. Read more at Illinois News Bureau.